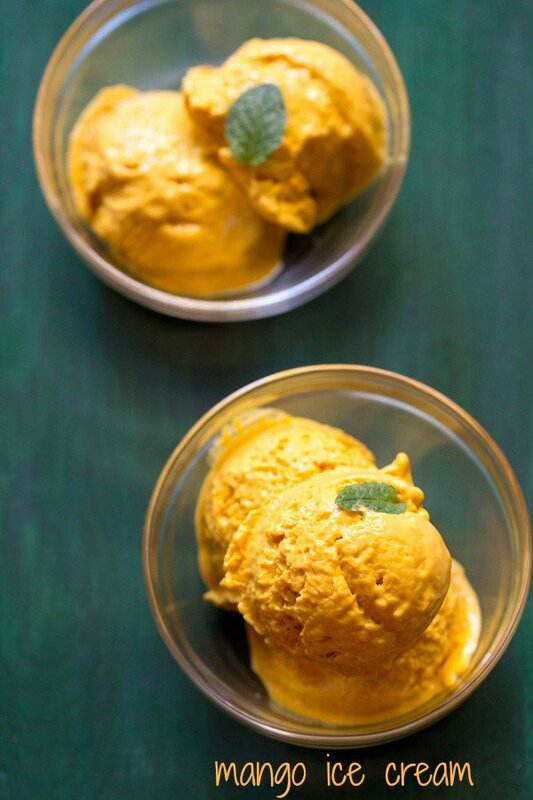 creamy & soft no cook mango ice cream made without an ice cream maker. 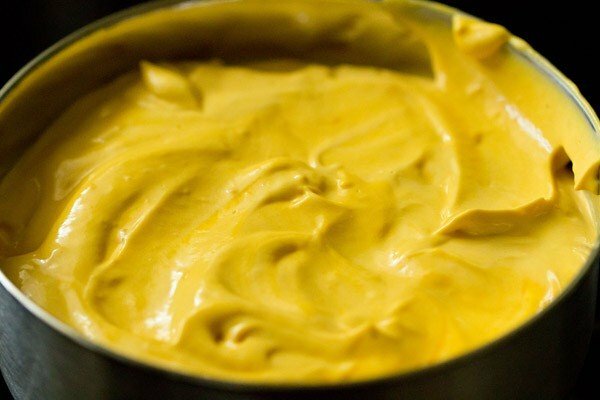 mango ice cream recipe with step by step pics – easy recipe of delicious mango ice cream made without an ice cream maker. so this is a three ingredient mango ice cream made with mangoes, fresh cream and sugar/honey. yes vanilla is also added, which makes it the fourth ingredient. but its entirely optional and you can simply skip it. 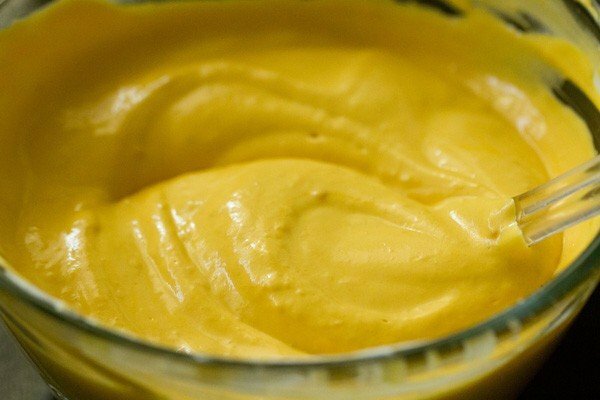 every year during summers, i make this no cook mango ice cream a couple of times. in the indian summer season, the markets are flooded with mangoes. i always make it a point to buy organic mangoes in this season. this recipe was also a request, as a dear & frequent reader suhani had requested me to post some ice cream recipes. 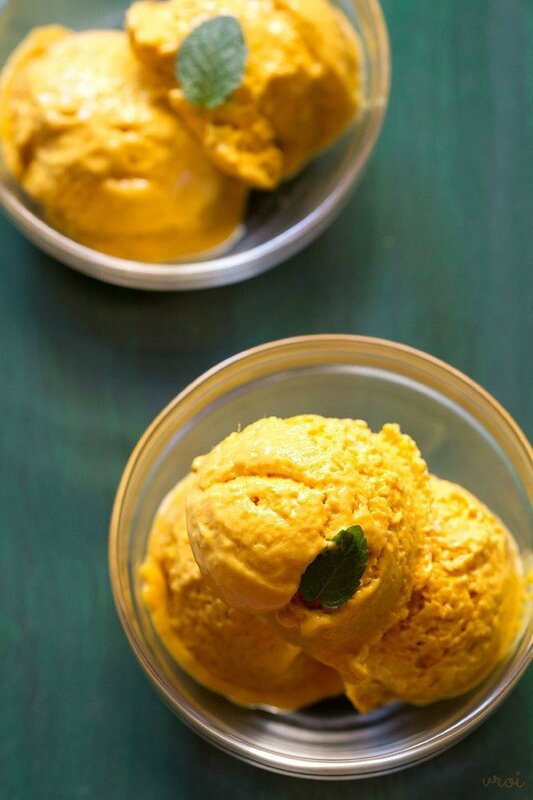 this quick mango ice cream is adapted from the pomegranate gulkand ice cream i had posted some months back. i have also posted another version of mango ice cream which is made with condensed milk. 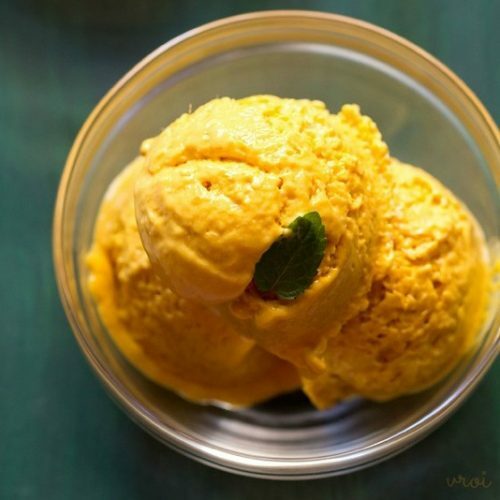 serve this creamy mango ice cream plain as it is or topped with some finely chopped dry fruits or with a chocolate or caramel sauce. 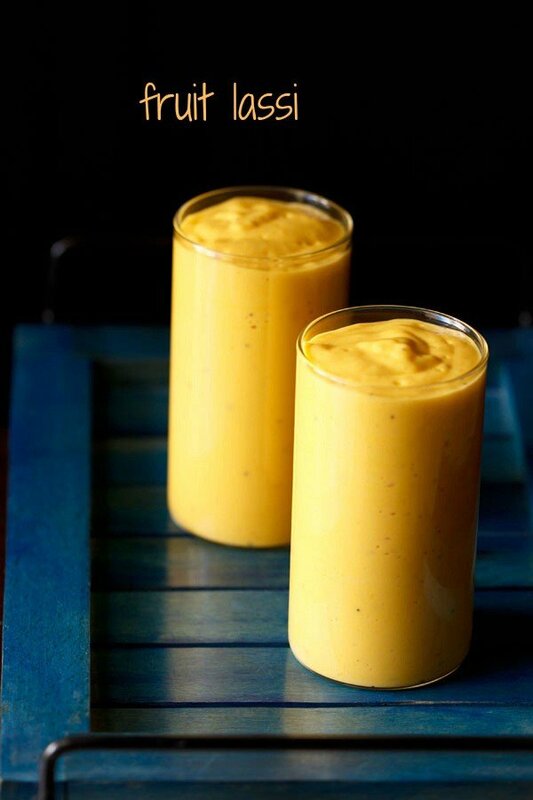 if you are looking for more mango recipes then do check mango kulfi, mango cake, mango mastani, mango falooda, mango cheese cake, mango milkshake and mango mousse recipe. 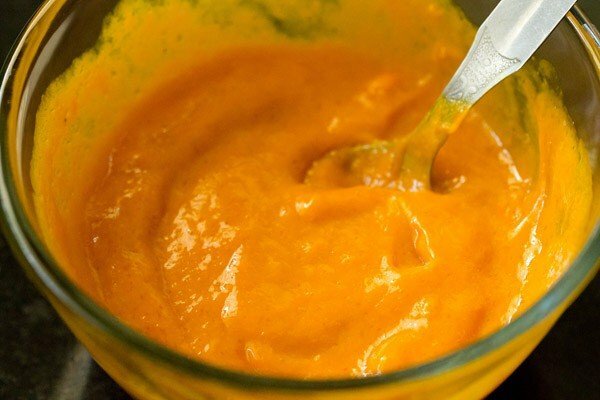 blend the mangoes, vanilla extract and sugar to a smooth pulp. whip the cream till soft peaks are formed. then add the mango pulp. fold or mix well. check the sweetness and add more sugar if required. 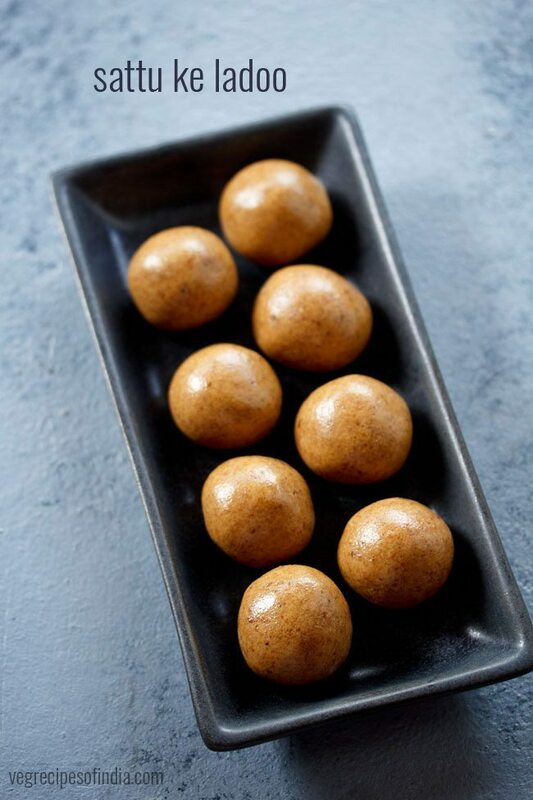 pour in a tray or container and place in the freezer. cover the container. whip again for a minute. pour the mango ice cream contents again in the container with lid. 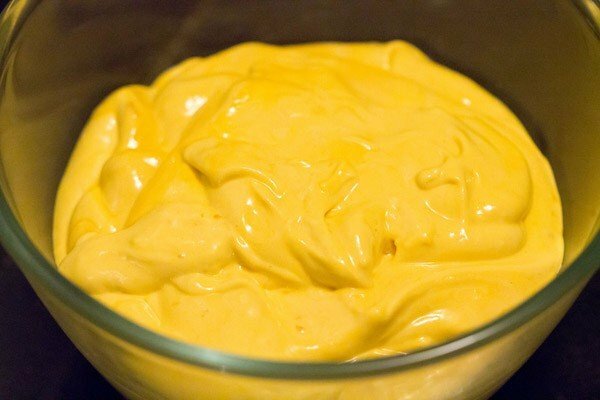 1. instead of whipping the cream separately, you can also just whip the cream in a blender with the mango puree till soft peaks are formed. 2. sweetness can always be adjusted as per your requirements. 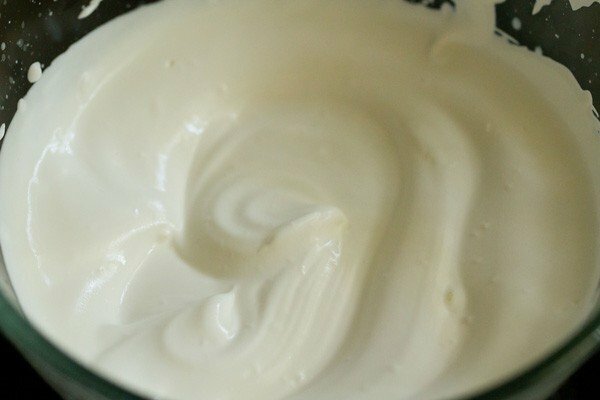 3. for best results and a softer texture, whip the cream really well. 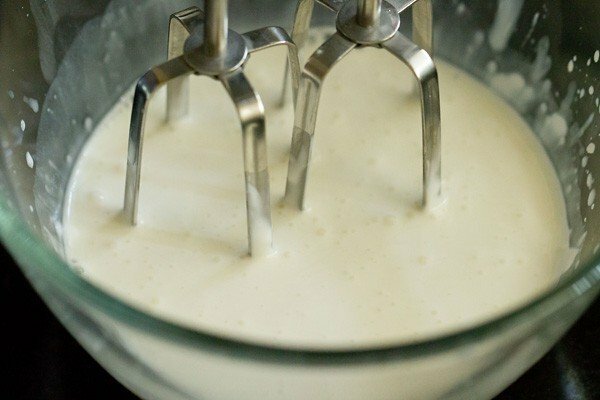 you can also whip the cream in a blender or a hand blender. 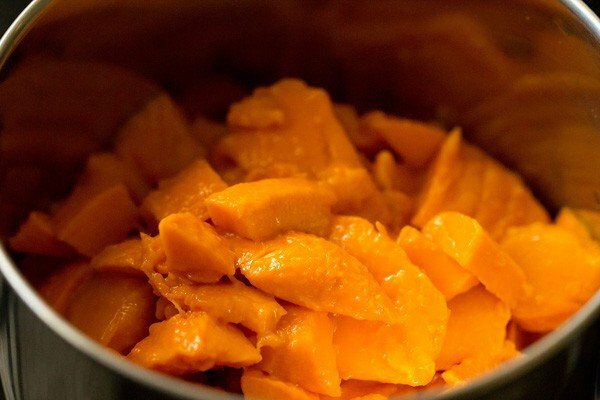 1: peel and chop the mangoes and add them in a blender or mixer jar. 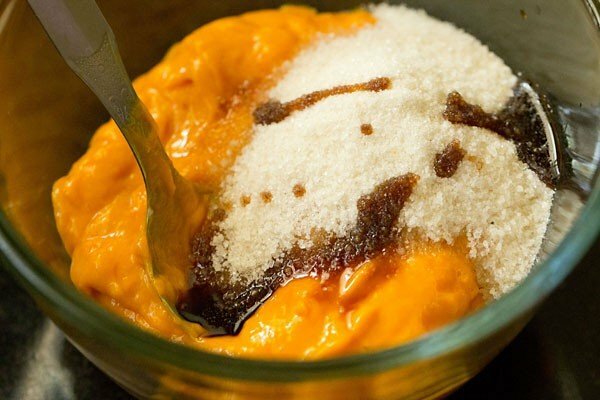 3. then add add sugar or powdered jaggery & vanilla extract along with the mangoes in a blender. you can also use honey. i have made this ice cream both with sugar as well as powdered jaggery. both ways the ice cream tastes good. 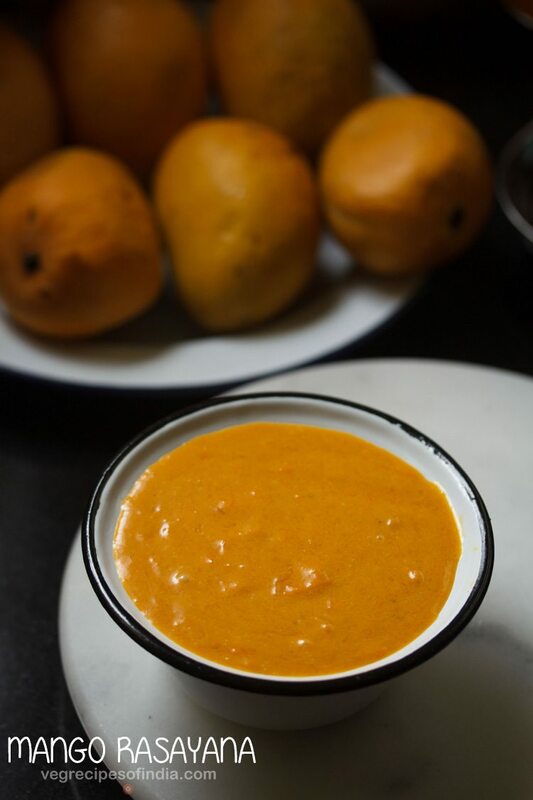 you can also add the sugar or jaggery when blending the mangoes. 4. mix well till the sugar dissolves. 5. in another bowl begin to whip the cream with an electric beater. 6. whip till you get soft peaks in the cream. don’t over do as then the cream will curdle and whey will be formed along with butter. 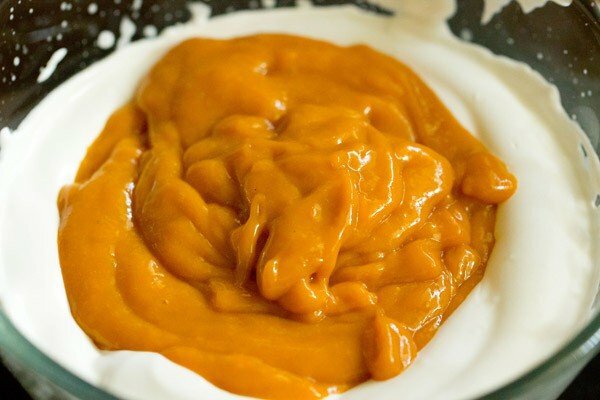 7. add the mango pulp to the whipped cream. 8. fold or mix gently. 9. the entire ice cream mixture should be mixed evenly. 10. pour the ice cream mixture in a freezer proof container or box. cover the container tightly with a lid. even the top with a spatula. 11. keep the mango ice cream in freezer for a few hours till the ice cream is half set. 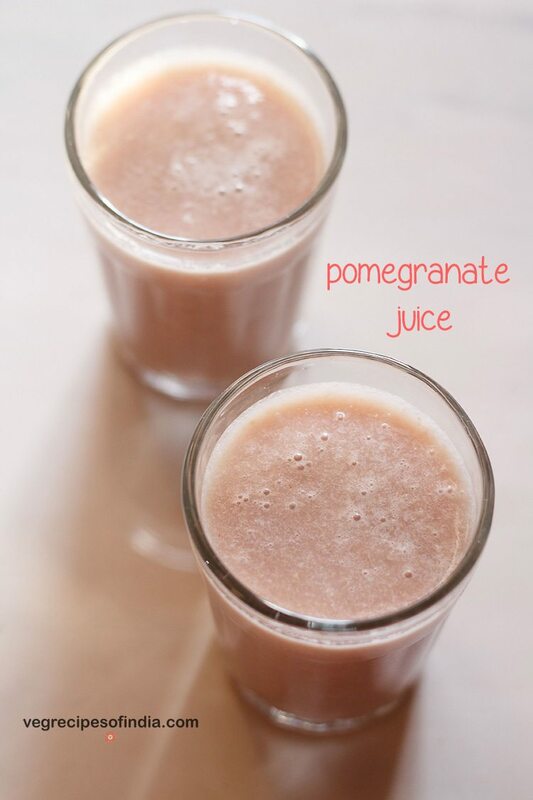 remove and add the ice cream to a blender jar or in a bowl. 12. whip again till smooth and you see the volume increasing. you can also whip in a blender or food processor. then pour in the same container and freeze till set. remember to cover the container with a lid. 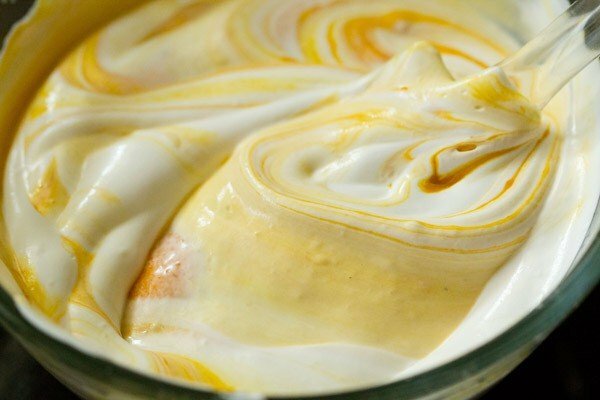 you can also whip the mango ice cream once more after it partly sets again, for a more smoother texture. 13. once set, then serve the mango ice cream scoops topped with honey, chocolate sauce or you can even serve it with slices of cake as a dessert. Welcome Jovi. Thanks for your positive feedback. Can we use ghar ki malai instead of whip cream. Roma, yes you can use. shikha, you can increase the proportions of the ingredients by 4 times. I don’t have cream.Instead of that can I use any other thing? 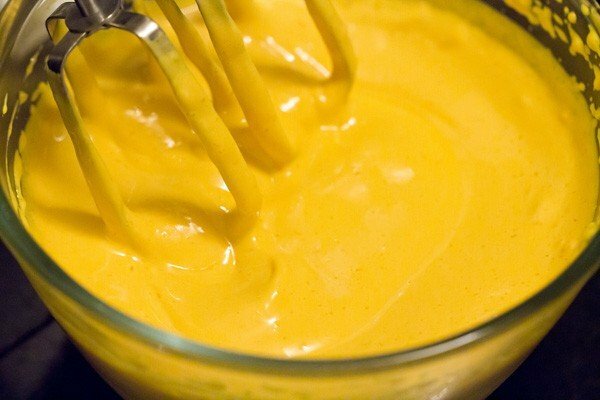 cream is required for this recipe. there is no substitute for it. 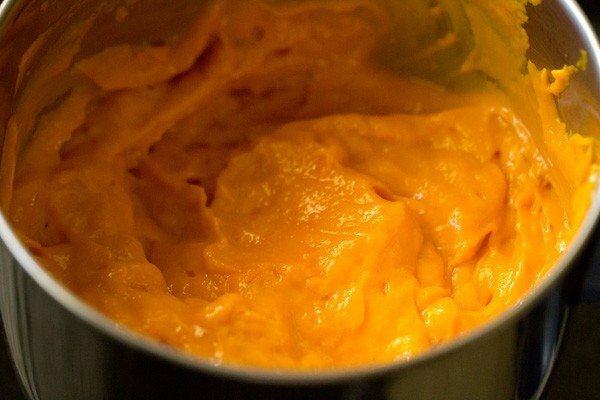 Made this mango icecream in my ice cream maker , so obviously there was no issue with ice crystals. 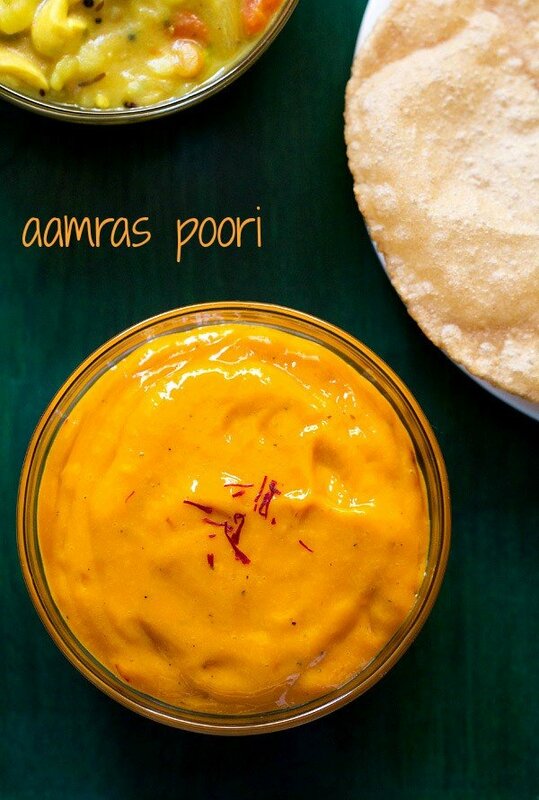 This is a lovely recipe and in season I would recommend using fresh mangoes. By family and my friends said this is by far the best mango icecream they had eaten. 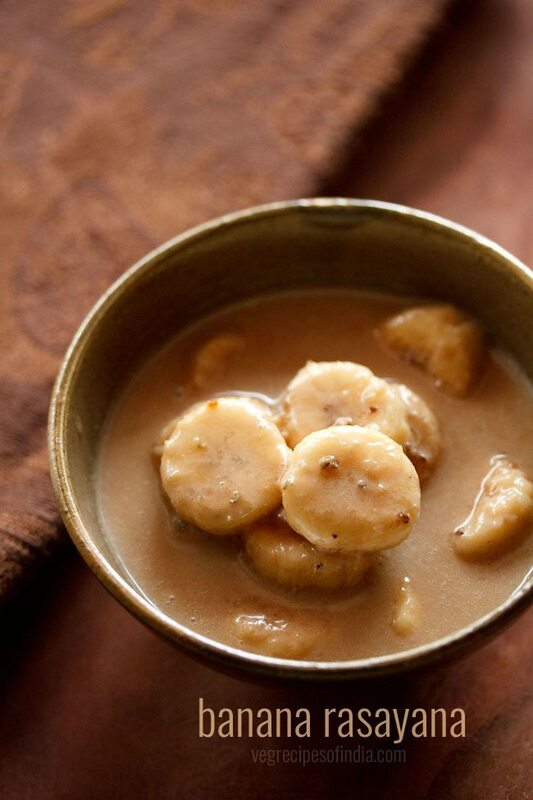 Thanks for yet another winning recipe Dassana. Welcome Anu. Thanks for your kind words and awesome feedback. Nice to know that everyone liked the ice cream. i know about cms and stabilizer. in fact i had even got a packet of it. but i am not sure of using it. hence the packet is still lying and i have not used it. i feel conventional methods of preparing food are always better. you can use 2 tablespoons of chopped agar agar strands. regarding gelatin i am not sure how much will be required as i have never used gelatin in any recipe. It really came out yum.But colour of the ice cream is like pale yellow…may be bcoz of pulp colour. thanks pravallika for the feedback. the color depends on the color of the mangoes. if the mangoes have light to medium yellow color, the ice cream will get a pale color.